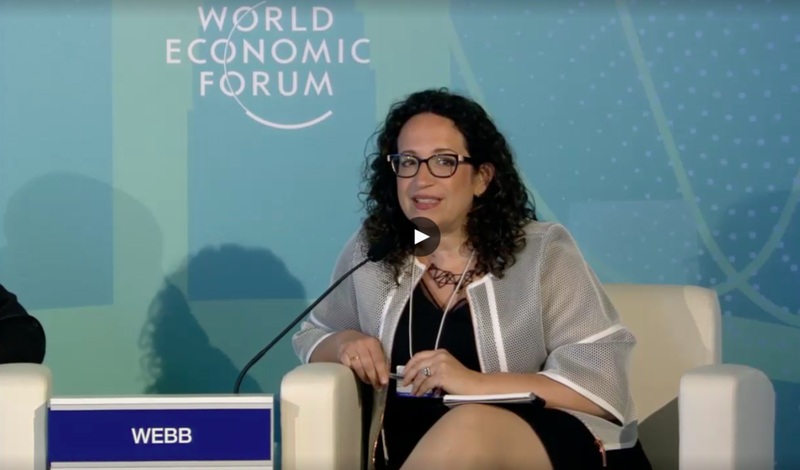 Amy Webb, one of America's leading futurists, has spoken to numerous audiences all around the world, from the Milken Institute Global Conference, to Fidelity Investments, the Aspen Institute, IBM, Microsoft and SXSW. Her TED talk, about the future of data and algorithms, has been viewed 5 million times, translated into 32 languages and is part of Delta Airline's in-flight entertainment. Amy Webb is a quantitative futurist. She is a professor of strategic foresight at the NYU Stern School of Business and the Founder of the Future Today Institute, a leading foresight and strategy firm that helps leaders and their organizations prepare for complex futures. Founded in 2006, the Institute advises Fortune 500 and Global 1000 companies, government agencies, large nonprofits, universities and startups around the world. Amy was named to the Thinkers50 Radar list of the 30 management thinkers most likely to shape the future of how organizations are managed and led and was won the prestigious 2017 Thinkers50 RADAR Award. Amy’s special area of research is artificial intelligence, and she has advised three-star generals, White House leadership and CEOs of some of the world’s largest companies on the future of AI. Amy is the author of three books, including The Big Nine: How The Tech Titans and Their Thinking Machines Could Warp Humanity (PublicAffairs/ Hachette, March 5, 2019), which is a call-to-arms about the broken nature of artificial intelligence, and the powerful corporations that are turning the human-machine relationship on its head. Her last book, The Signals Are Talking: Why Today’s Fringe Is Tomorrow’s Mainstream (PublicAffairs/ Hachette, December 2016), explains Amy’s forecasting methodology and how any organization can identify risk and opportunity before disruption hits. Signals is a Washington Post bestseller, was selected as one of Fast Company’s Best Books of 2016, won a 2017 Gold Axiom Medal for the best book about business and technology and was one of Amazon’s best books 2016. Signals has been released in multiple international editions and has been translated into a number of languages. Her bestselling memoir Data, A Love Story (Dutton/ Penguin 2013) is about finding love via algorithms. Her TED talk about Data has been viewed more than 6 million times and has been translated into 32 languages. Data is being adapted as a feature film, which is currently in production. Amy has spoken to numerous audiences all around the world, including at the World Economic Forum, the Milken Institute Global Conference, the Aspen Institute, SXSW and TED. She has also addressed teams at hundreds of companies, including IBM, Microsoft, UnitedHealth Group, Fidelity Investments, MasterCard, AmericanExpress, Google, BestBuy and more. She is a frequent guest on television shows and podcasts. Her TED talk, about the future of data and algorithms, has been viewed close to 7 million times, translated into 32 languages and has been part of Delta Airline's in-flight entertainment and Marriott's in-room videos. Amy Webb is represented exclusively by Stern Speakers. Please be in touch with Danny Stern at danny@sternstrategy.com, Mel Blake at mblake@sternstrategy.com or Ania Trzepizur at ania@sternstrategy.com with your request. You can also reach them at (908) 276-4344. AI’s destiny is in the control of nine big corporations in the U.S. and China. The American portion of the Big Nine—Amazon, Google, Apple, IBM, Microsoft and Facebook—have big ideas about how to solve some of humanity’s greatest challenges, but they’re beholden to the whims of Wall Street and have only a transactional relationship with Washington. Meanwhile, China’s portion—Baidu, Alibaba and Tencent—are very much tethered to Beijing and the demands of the Chinese Communist Party. All of us are caught in the middle, as our data are mined and refined in service of building the future of artificial intelligence. What are the optimistic, pragmatic and catastrophic scenarios for our future as we advance from artificial narrow intelligence, to artificial general intelligence to artificial superintelligence? While these scenarios are intense, there’s still hope. Amy will show you how we still have a say in our futures, and that we can change course by making better decisions today. You’ve undoubtedly studied trends within your own industry, but how can you prepare yourself and your business for what’s next in a world of constant disruption? In this custom, provocative presentation, Amy Webb contextualizes the top trends from within and adjacent to your industry and explains how they fit into a more holistic vision of the future. She will distill and help your organization prioritize which trends to pay attention to, and how to think more exponentially about what’s on the horizon. Amy has shared tech trends on some of the world’s largest stages, including SXSW. The world’s most successful leaders must manage the present and innovate for the future. This requires a new kind of strategic thinking. Drawing from her bestselling, award-winning book, “The Signals Are Talking,” Amy Webb explains how leaders can harness a futurist’s strategic tools for the benefit of their organizations. In this presentation, you will learn how to think like a futurist, how to rethink risk, and how you’ll know when to act. As a backdrop, Webb will share future scenarios of emerging technologies from your industry and those adjacent to it: artificial intelligence, self-driving cars and biohacking – helping you discover your own ability to not only forecast what’s on the horizon, but how to create your own preferred future today, in the present. When it comes to artificial intelligence, there is a tremendous amount of misplaced optimism and fear. In this accessible session, Amy Webb will explain what AI really is, why it matters, and how it's already a part of our everyday lives. This presentation will be customized to include specific use cases for your organization or industry. By the end, every participant will be well-versed in what AI is, and they’ll have a greater understanding of its opportunities for your organization. Soon, technology will begin to intersect with our daily lives in weird and wonderful ways. We don’t often think about that intersection, and yet emerging technology will be used to design the future of humanity. In this mind-bending session, Amy Webb will offer a provocative series of snapshots from our near and far future. How will we communicate? Where will we live? Will sophisticated algorithms and artificially intelligent systems replace the relationships we have with other humans? What will our technology do for us? To us? The possibilities are exciting, inspiring – and a little scary. In the near future, we will be surrounded by invisible infrastructure enabling your house to talk to your car and your car to talk to your wearable devices. Amy Webb quickly explains what the IoT is and why it’s so important; she then launches into scenarios that tie the IoT directly to your field. She discusses what to expect as the IoT matures and how your industry – and you, yourself – will fit into the ecosystem. It’s a field worth tens of billions of dollars – but there’s a catch. What are the second, third and fourth order implications of the IoT? What happens when all the devices in our lives start talking to each other? Webb discusses the promise, power and potential peril of the future of IOT. The convergence of a number of technologies – ubiquitous WiFi, self-driving cars and trucks, digital assistants, drones, genetic engineering and organic building materials – will start to change our cities in the near future. Everyday life will look quite different, but so will city management. Think landscapers, tiny urban farms and the end of gridlock. Amy Webb shares a snapshot from the future, detailing all the ways in which our cities are likely to evolve, and offers warnings for business and government leaders – not to mention the average citizen – living in the present. We use “barbarian” to describe people who are uncivilized; it’s easy to imagine humanity’s primitive ancestors as horrible, ignorant savages. But consider this: won’t future generations think the same of us? What are we doing today that people in the far future will think are barbaric? To start, we farm our meat instead of growing it. We discriminate based on race and gender, rather than our intellectual, emotional, financial and physical capabilities. We take blunt-force pills intended for the general population, not hyper-personalized chemical compounds delivered via nanobots. In this eye-opening session, Amy Webb flips what feels comfortable and familiar on its head as you journey deep into the future. Amy Webb's TED talk about how she hacked online dating. Amy Webb discussing scenarios and FTI's research on future job disruption at the Milken Institute Global Conference.